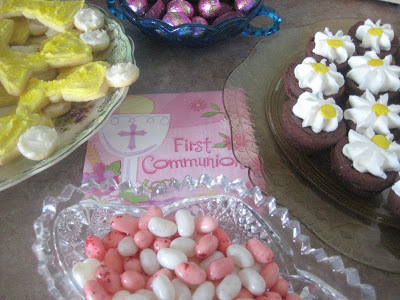 When we first started planning my oldest girl’s First Holy Communion, I was very mindful of wanting the Sacrament to be the highlight of the day. Yes, it was a time to celebrate! 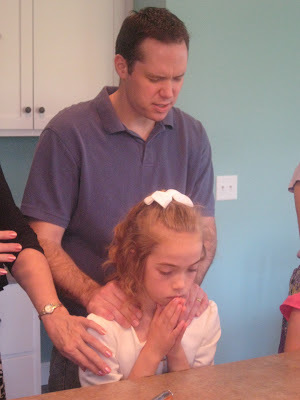 But I didn’t want the party or the gifts or the decorations to take away from what was really happening that day: My daughter receiving Jesus for the very first time! Nothing should overshadow that. My daughter suggested a dessert party. (She has the biggest sweet tooth!) And while I loved the idea, I knew we also needed to serve real food, for we would be gathering around noon. So, we settled on brunch. I had a rough-draft of a menu in mind, but it really needed some fine-tuning. So, I consulted the author of my favorite (and only) food blog, and she was so kind to help me along in the menu-planning process. Thanks, Barbara! 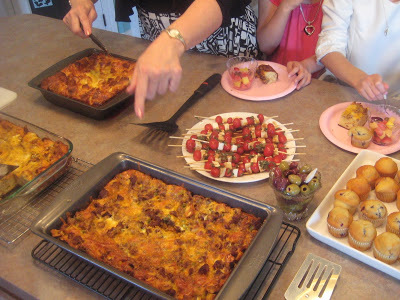 To make this meal more special, we used antique serving dishes from my mom, grandmother and even my great-grandmother. My daughter has a fondness for old things, so this really made it special for her. We had a dessert buffet after brunch, to keep my daughter’s original request. 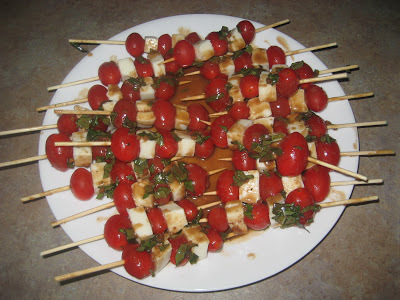 Oh, my gosh, those salad skewers look soooo yummy!!! What a wonderful meal for a wonderful day. I love how you all prayed over her. Beautiful! Isn't that just the best cookie cutter? What a great party, Sarah. You kept it simple enough to maintain the focus of the day, and special enough that I'm sure your guests had a great meal. Beautiful dessert table! it all looks and sounds so delicious!